If you want to head over to New Jersey to check out Tony Soprano's 'gentleman's club' Badda-bing, Microsoft has just the site for you - Bing Travel. Well, it would be if the airfare and hotel comparison site was working in the UK, which it didn't seem to be when it launched here yesterday at www.bing.com/travel. If the UK site is anything similar, the travel 'decision engine' will feature many of the airfare and hotel tools from Microsoft's 2008 acquisition of Farecast, sexed up with news and editorial content from MSN Travel. 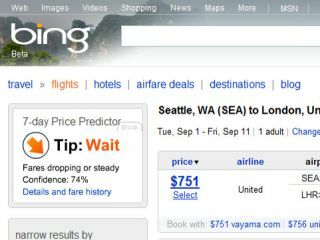 Top of Bing Travel's key features is Price Predictor. Bing Travel uses Farecast technology to analyse more than 175 billion airfare observations and predict whether the price of a flight is going up or down. It offers users a recommendation of 'Buy Now' or 'Wait', including a confidence level and expected price increase or decrease over the next seven days. Rate Indicator is a similar tool for hotels, analysing historical rate data from thousands of hotels to determine whether the current price is a good deal, or not a deal at all. People can view a city map with details for each hotel, color coded by Rate Indicator data. There are also the usual comparison pricing engines for flights and hotels (with handy sliders to narrow the results), easy booking and fare alerts to send you updates on your trip details if the price should suddenly drop.